Petra, one of the 7 Wonders of the World, is undeniably on many people’s bucket lists. For many visitors, visiting Petra is the only stop on their Jordan trip. It’s surely a price trip, so you might want to get the most out of your visit. Here are my most essential tips for visiting Petra. Also known as the Rose City because of the color of the stone it is carved from, Petra was established in 312BC as the capital city for the Nabataeans. It remained under Nabataean rule until 100 AD when the Romans invaded it, and in the 12 century it was finally abandoned and left to the local people. The site remained unknown to the western world outside local communities until 1812 when a Swiss explorer Johann Ludwig Burckhardt found it. The Lost City of Petra was designated a World Heritage Site on December 6th, 1985 and became Jordan’s most visited tourist attraction. The Treasury was named so because it was believed to have treasures hidden inside. I was told that there were four lions at the top of it, but the Bedouins used to shoot at the facade and these statues because they thought that Pharaoh put his gold and treasures in them. However, no treasure has ever been found there. These days, the official info is that Bedouins are the only one who is allowed to live on the site. They used to live in caves on the site, but these days they might occasionally sleep in their local stalls if even. They’ve moved to a nearby village, but return to the site on a daily basis to make some money. No one actually knows what the treasury was for. Solo Female Travel to Jordan – Is It Safe? How Many Days Should You Stay in Petra? How Much are Tickets for Petra? What to Wear at Petra? Many ask whether it’s safe to travel to Jordan as a solo female. I think the definition of safety is relative and depends on personal experience. Define “safe” first. In the same place, one woman can feel at ease, but other can struggle. If you ask me, I’d tell you that I felt completely safe at all times. As I always say: use your common sense when traveling and trust your instincts when it comes to strangers. The most famous woman traveling to Petra is probably Marguerite van Geldermalsen from New Zealand who met the charismatic Mohammad, a Bedouin man living in a cave in Petra selling souvenirs, who convinced her that he was the man for her. She’s written a book about her experiences called Married To A Bedouin, which you can buy there and visit their souvenir stall. There are two popular ways to get to Petra. First, you need to either fly to Amman, or cross the border from Israel in Aqaba. If you’re flying, I recommend finding the cheapest flights on Skyscanner. I flew from London with MEA (Middle East Airlines) with a layover in Beirut, Lebanon and I can highly recommend this airline. Once you reach Amman, instead of heading to the city I recommend going down to Petra first as it’s an opposite direction from the airport than Amman city. While there are some buses to Petra, they aren’t frequent and not too reliable. You can take a JETT bus from Amman downtown to Wadi Musa. Your best bet is to either rent a car and drive or hire a driver to take you. A driver can be easily arranged upon arrival, as everyone offers to take you anywhere. I have to warn you, it’s not cheap. I actually drove myself and I can’t recommend this option enough as it’s flexible and about 6 times cheaper than hiring drivers. Driving in Jordan was easy (outside of Amman), most roads were empty, and easy to navigate without wifi since you just follow the King’s Highway (you can get a local SIM CARD at the airport with 6 GB of data and unlimited calls for $8). No one was ever bothering me when driving alone as a solo female either. I booked my rental car on Orbitz. I recommend getting a car from a company that’s located within the terminal of the airport since I was struggling to find a shuttle to my rental car company outside the airport. It turned out they reached out to me on WhatsApp to let me know when to pick me up, which was slightly confusing. Even one full-day at Petra might not be enough, leave alone just a few hours like most tourists tend to do. With more than 800 registered sites sprawling across 102 square miles, it’s a place where you can hike for days and keep finding new spots. Petra Visitor Center and Ticket Office opens from 6 am and closes at 4 pm in the winter and 6 PM in the summer. I was told that I should start my exploration right when it opens to avoid the crowds, but I can assure you that when I entered the site at 8 am there were barely any other tourists around, and the sunlight wasn’t even lighting the Treasury up (it happens around 9:30 am). I had to wait for the sun to make its way over the high cliffs. You should definitely be planning on staying at least one night in town in order to see Petra by Night, the unique opportunity to see the Treasury and Siq surrounded by beautiful lights. Petra by Night starts 8:30 pm and finishes around 10:30 pm. Visiting Petra isn’t cheap. Even the whole town is also ridiculously overpriced in terms of accommodation and food. For the same thing you pay in Amman 2 JD, in Petra you pay about 9 JD. But don’t let it scare you – I think it’s definitely worth your time and money. Entrance to the Petra site will cost you 50 JD ($70) for a one-day pass, 55 JD for a 2-day pass and 60 JD for a 3-day pass. The price of your ticket includes a free horse ride to the entrance of the Siq (you don’t really need it though and you’re expected to give a tip). Petra by Night is not included in day-passes and costs additional 18 JD. If you’re planning on spending a decent amount of time in Jordan, you might consider buying Jordan Pass. It’s a tourist card that includes entrances to many sites and waives the amount you need to pay for Jordan visa (40 JD). Basic Map of Petra that everyone shares. It only shows the most basic tourist route = incomplete. The correct Map of Petra and even here they didn’t have space to include some places, like the snake rock in the left corner. The spots I recommend the most are 28, 29, 30, 32, 32, 33. Siq (a canyon that serves as the entry to the city) is actually one of the biggest highlights of the experience. You’ll walk through the narrow canyon, smoothen by the river. Parts of the corridor still has majestic sculptures and drawings, but most of them got destroyed. Notice the pipes and gutters along the walls as they were important components channeled water into the city. Once you reach the end of the corridor you’ll see the most iconic site in Petra, Al-Khazneh (the Treasury). It’s monument at the top of most visitors’ itineraries. It served as a tomb for a Nabataean king, as most of the structures at Petra. From there you can either continue the tourist route or walk up to the High Place of Sacrifice (no.28). Scroll down to -> My Best Tips for Visiting Petra. Theater (no. 6): With over 8000 seats (Romans added about 5000 seats), the Theater is impossible to miss. It’s a great site to see and even better to see from above from the High Place of Sacrifice. Royal Tombs (no. 7 & 8): are another great stop. Getting to the four distinct tombs involves a tough climb, just beyond the Theater. Behind the tombs, there’s another path to the panoramic view of the Treasury, but frankly, I don’t recommend this route. Petra Monastery (no. 4): is the furthest site on the tourist route.The Monastery is about 50 meters tall and is surrounded by panoramic views of the valley. It’s also the only place at Petra with bright green plants in front of it. Getting there involves a long journey climbing the stairs, that many choose to do on a donkey. I walked and it took me about an hour, maybe a bit longer. It’s totally manageable and surely safer than on a donkey often slipping on the stairs. Also, decide for yourself whether you want to take a donkey or not after seeing them. Some owners keep their donkeys in great shape, but I also witnessed many who were attached to each other tightly without a possibility to move, get water or anything, just waiting for tourists to hire them. Unfortunately, you cannot go inside Petra Treasury anymore like Harrison Ford did in Indiana Jones. Fellow tourists are to blame for this ban since they were screaming inside and the noise was destroying the structure. Basically, this is why we can’t have nice things. In 1989, Hollywood set Indiana Jones and the Last Crusade in Petra. Other features include The Mummy with Rachel Weisz, Queen of the Desert with Nicole Kidman, Mortal Kombat: Annihilation, Sinbad and the Eye of the Tiger. The most recent movie filmed at Petra was Transformers II, but quite frankly I haven’t watched it and have no desire to. This cat wanted to be an actor. He played dead when I tried to take a photo. Petra is located in a small local town called Wadi Musa offering a various range of available hotels and restaurants. Many people just visit Petra and leave, but if you want to get the local vibe, do yourself a favor and walk around Wadi Musa itself as well. If you’re driving your rental car, the location of the hotel doesn’t matter that much. However, if you’re opting for a private driver or bus, you might want to stay nearby the entrance of Petra unless the hotel provides a shuttle to the Visitors Center. Otherwise, you need to pay extra for a taxi (2-3 JD). If you don’t have time to go to Wai Rum desert, you can sleep in a Bedouin camp near Petra too. Seven Wonders is a beautiful campsite, they serve delicious dinner and breakfast and you can be at Petra in 15 minutes. If you’re into budget hotels, pick either Candles or Petra Moon. They’re pretty much next to each other, within 1000 feet from Petra entrance. I stayed at Candles Hotel myself and it had everything I needed: working wifi, hot water in the shower and comfortable bed. Petra Moon has a better in-house restaurant though. If you’re looking for a hotel with more of a local vibe, opt for a Rocky Mountain. The view from the terrace is amazing. It is too far to walk to Petra, so you need a car or taxi if you want to stay there. The best luxury hotel in Wadi Musa is without a doubt, the Movenpick. Located just in front the entrance to Petra, it’s a great hotel, but compared to others not cheap. I won’t lie, there’s a lot of walking involved in visiting Petra (the whole route comes down to 15 miles and involves climbing) and the best parts of it aren’t so easily accessible. So my best advice is to bring a pair of comfortable shoes. I wore a simple pair of tennis from DSW and they surely passed the test. cash – for tips, tea, donkeys (if you want), warm lunch, etc. Apart from comfortable shoes, you can really wear whatever you want. Petra is a tourist attraction and no one really expects tourists to follow a certain conservative dress code, but you might not want to wear a too skimpy outfit to draw an additional attention to yourself. I’ve seen people in short dresses, jogging outfits, jeans, shorts, even a girl in leather pants. When I went to Jordan (February) the morning was a jacket weather and during the day it got mildly warm. I was fine with long sleeve top and breezy skirt, but if you aren’t comfortable with climbing rocks in long skirts like me, you might want to put a pair of pants on instead. The vast majority of visitors wore a hat. I honestly regretted not bringing mine, so you should do it. Climbing to get to the viewpoint of the Treasury. You can’t see the whole site in one day, even when using a donkey. Most day tours and any types of tours just lead visitors to the Treasury for a photo opportunity and back. Many visitors feel like they waste a lot of money without getting much in return by doing that. I would too. It used to be a camel and a man before water destroyed most of it. 2. Don’t hire a guide at the entrance, get one inside Petra. There are many guides waiting for tourists to hire them right at the entrance of Petra. Naturally, many people hire them. I strongly advise against it, not because I don’t like having a guide (quite the opposite), but those guides will take you down the tourist route down the road and you can do it all on your own. What you can’t do on your own, however, is going to the shortcut to the best view of Petra Treasury. But the guide hired from the entrance isn’t going to take you there, because he can’t. 3. There are Two Ways to Get to the Best View of Petra (the one from the top!). That said, there are two ways to get to the viewpoint of the Treasury. Both aren’t the easiest hikes, some parts involve climbing some rocks, but don’t worry – you can do it! One, on the right side, is a regular route that you can do on your own starting from behind the Royal Tombs. It will take you about 45 min to 1 hour to reach it and then you’ll have to go back the same way. The second way is a shortcut, for which you need a guide. There are many ‘bedouin’ guides waiting for you once you reach the treasury (They’re technically not Bedouins since the ‘bedouins’ living at Petra are actually Bedul gypsies). I highly recommend it, as not only it will save you time, but also enable you to reach the not so touristy route of Petra from the High Place of Sacrifice. Many maps of Petra don’t show more than the typical tourist route. But if you decide to explore more of Petra and go down from the High Place of Sacrifice, you’ll have the best time. There were barely any tourists there (I met like 5 in 4 hours), you can go inside many structures, drink some tea with the locals and play with their kittens. The rocks in that area had way more colorful than anywhere else in Petra. See tourists and sites from above. 5. If you’re heading to the Monastery, do it at the end of the day. Most blogs and sources will tell you to get to the Monastery first and see other things on the way back. I disagree. I think you should head there in the afternoon, simply because it will be less sunny to climb the stairs up there (it’s quite a hike!) and it will be less busy. If you get there around 3 PM, most tourists will be walking away (as they choose to go there straight after the Treasury), so you can get the site to yourself. There was barely anyone when I got there around 3 pm as I passed most tourist leaving on my way up. On the way back, stop at the orange juice stall close to the top (not at the top). It’s very refreshing and I highly enjoyed sitting with a group of locals and chatting about their lives. Any questions about visiting Petra? Let me know! Petra has always been on my bucket list! Looks like such a unique place to visit. Thank you for your comprehensive guide. Interesting! I went to Petra some years ago (got to go inside the Treasury) as a solo female traveler. I had hired a guide, who came with a driver (in a rickety taxi, whose meter clicked along the entire time). It was all so cheap I didn’t care. My guide was an older guy named Elias, who had about two teeth and who was well-known at every stop (we also went to Wadi Rum and visited the Crusader castles). I spent two days at Petra, one guided by Elias, and one completely alone, where I just aimlessly took paths. It was before cellphone coverage and I didn’t get lost. I also didn’t take a camera–I bought some photo books and just spent my time soaking it in and sketching. I cannot emphasize enough how much I loved Petra. Amazing place that should be on everyone’s bucket list! Trully amazing, people are sometimes questioning the safety but I did Petra on a solo travel and hadn’t feel in danger at all. Great tips! We are planning to organize a trip to Petra and this article is very helpful for me. I really like this article so much. Thanks and keep sharing. Thanks for sharing. Great tips! whats the best time to visit when there r few tourists? There weren’t many when I went, which was at the end of February. I will be in Jordan the end of September and of course visiting Petra. My question is: I have vertigo issues (actually more along lines of a severe fear of plummeting) and wondered if the trails around Petra were sheer/drop offs or sloping or ?? PS – loved discovering your blog! The basic trails are flat and wide, so you won’t have any issues. However, to go up and see the Treasury from below might be an issue. Great info! I found it very useful as I head there this week. Do you need a guide to see all the other sites of Petra? How do they work out when you need a guide or not? And, how do you keep mobile phone and powerbanks cool in the desert heat? I have three full days in Petra and two days in wadi rum. The weather will be ALOT hotter from when you were there. Any advice anyone? Hi! No, you can easily wonder by yourself to other sites. My phone and camera were actually fine, it gets cold in the desert at night. Great read and extremelly helpful for my trip next March as a solo female traveller. When you were in Jordan did you just go to Petra or do you have more tips and tricks for other places? Hi! I also visited Amman as I have friends there, went to Wadi Rum and stopped at Karak Castle. Thank you for this very informative post! My wife and I are going to Petra this September. We’re thinking about going up to the top view of The Treasury. Would you be able to give a ball park on the amount / fee for the guide just for the top view of Treasury? Thanks a lot! Safe travels! It really depends on your haggling skills and how busy they are (if they’re less busy they’re much more likely to give you a lower price). Between $20 to $70 I’d say. Hi Anna. Thank you for the information. Will definitely haggle for this. By the way, I love reading your posts, very informative. Keep it up and safe travels! Thank you. Great information. We are planning to go in October. Do you have an index to your map? For the second map? I’m afraid not, and it would be really hard to find as some of the tombs aren’t identified. Each site has a piece on information about it when you get to it though. How long did the walk around Petra take you. Not just the tourist track, but similar to your off the beaten track. I’m slightly slow because I take a lot of pictures 😛 I entered the site around 8am and left around 7pm. No donkeys or horses, just walking, but I did stop for lunch, juice and tea. Thanks for writing such a wonderful post. Awesome tips really helpful for travellers who want to visit Petra. I have read many posts and blogs about Petra and this is the most helpful of them all, so thank you. There is one question I am finding hard to answer. I think a lot of people who spend 2-3 days in Petra are not up for heavy walking so they spread out what an energetic person could do in a day. I will be there in early November when the weather is easy and I am expecting to spend a long day walking and exploring. Do you think I will feel I have missed out by just spending one day, or to put it another way, will I enjoy two days of heavy walking? Thanks and best wishes. Let me ask you this: are you a photographer? Photography always takes more time, for instance, I had to wait for a while at the top of the Treasury for the good light to show up, but I saw other tourists moving on. However, I consider myself a fast walker. I couldn’t make it to the Snake Rock, Monastery, High place of Sacrifice and main road spots in one day – I was told if I hired a donkey for the monastery then maybe if I skipped the main road I could also maaaaybe go to the snake road. Looking back, I probably wouldn’t have made it on time before dark. Thanks for your quick reply. I am not a photographer. I can see from your web page that you have taken a lot of trouble to take beautiful photographs. I am more the type who clicks a few times on the phone and then has a look later to see if anything good comes up. Also the type who walks to the bottom of the Grand Canyon and back in a day. My girlfriend has been before and is convinced we can pack everything into one day and spend an extra day doing more hikes elsewhere. I just don’t want to miss out, for example that photo of the stone hall (above the one with the cat), I wouldn’t want to miss that. Is it possible to use a mobility scooter on the tourist route? If not, are the carriages a viable option? They’re not allowed I’m afraid. You can however hire a golf cart or horse carriage to the Treasury (but not further). Unfortunately, these are not wheelchair accessible and some of people will need to be carried on to them and have their wheelchairs stowed in the back of the cart. The golf carts must be reserved ahead of time and cost around $110 (USD) for two people to go down to the Treasury and back. Horse carriages can be booked upon arrival. Question- Do you need JD Dollars or do they prefer American dollars? What is an appropriate amount or percent to tip local guides? We only have one day as we are staying in Amman. We hope to stay as long as possible. What would you be sure to ask the private guide to include and what would you discard with limited time? For example, should we take the horse back ride in? Is that more time efficient or is it better to walk in? You need JD dollars for everything, including paying for your visa at the airport. You can exchange the money at the airport or take our of ATM. There’s really no appropriate amount for tipping local guides, some will tell you. Are you staying overnight though or driving from Amman in the morning? You can start by going all the way to the Monastery and see how much time you have left. Horse carriages only go to the Treasury and later you can take a donkey or a camel (but I definitely don’t recommend it since they aren’t treated well). 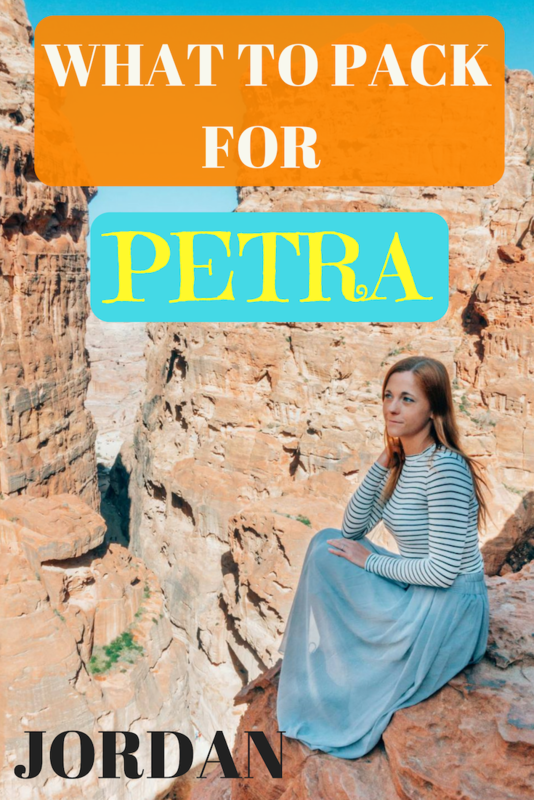 Hi Anna, great review of Petra and love seeing it being helpful for future travelers. I definitely recommend more than 1 day in Petra (at least 2, maybe 3 if some one has the time) and take it day by day (slow travel) to really the the feel and depth of the site. Thanks for sharing your experience and keep sharing about such a magical place. Love the pictures, absolutely stunning. Can I ask how long it took to walk back to the centre from the monastery? I’d just like to get an approximate timing for how far it is. Also is the walk very difficult? I have some knee difficulties so unfortunately I can’t really clamber over rocks all that well. Which center? To the main entrance of Petra or where? These are stone stairs.